'The Stars And Stripes'. 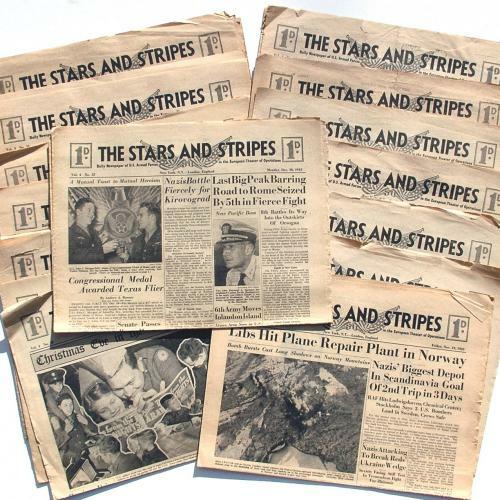 Daily newspaper of U.S. Armed Forces in the European Theatre of Operations. Printed in England by the Times Publishing Co. Ltd. Printed specifically for the numerous American servicemen in the UK at the time giving news about the war, life and sports in the UK and back home in the US. This lot is for 15 copies dating between November and December 1943. Most are between 4 and 8 pages in length. The paper is yellowed and there are edge tears, folds and some paper loss due to age. Fair condition. A great read... Stock code P21521.